Mmm Mmm Good! 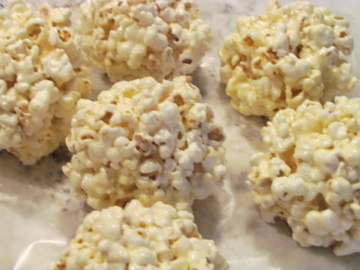 My absolutely favorite part of Halloween is popcorn balls made with marshmallow. As a kid, there was a lady around the corner who we could always count on getting one from every year. A couple of years ago, I was taking my niece around Trick or Treating and we stopped at her house. A handful of candy was given out until she realized it was me. She quickly disappeared into the kitchen and came back with two popcorn balls - one for me! I was thrilled, I didn't expect any candy let alone a popcorn ball. It was like heaven and a little piece of childhood restored in me. Pop your popcorn! You may use a paper bag in the microwave, some oil in a pan on the stove or, what I did, a popcorn maker. When finished, put popped popcorn in a 9x13 pan. Be sure to avoid putting any un-popped kernels in with it. Next, melt the butter in a sauce pot on low heat. Once melted, add marshmallows and continue to stir until they are melted. Remove from heat and pour mixture over popcorn. Now, comes the messy part. 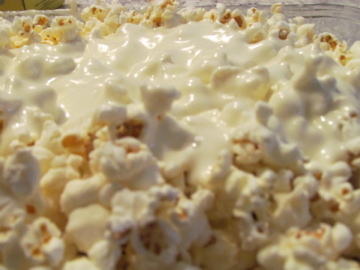 Mix the marshmallow mixture and popcorn until coated well. Then, cover your hands in butter and form popcorn balls. The recipe I used says it will make 8, but depending on the popcorn that turns out, some batches only made 6.